We are into week two of Curious. The course is pretty intensive, with Six days of practical workshops in technique and making a week; we also have a whole host of evening events, including our weekly soup nights; where we invite puppeteers and enthusiasts to join us. We have a guest Speaker, who is invited to give a presentation on what they do and then we have a question and answer session. We are encouraged to make connections and mingle. We also have a whole host of performances we attend, we are thoroughly encouraged to discuss the work we see critically with our class mates, which in turn helps us to understand the kind of work we want to make, and what we see works for an audience and what doesn’t. Week Two Day 7: Monkey says, Monkey DO? Start of the week; and we were all reeling from the show we had seen on Saturday night at the mime festival. It brought up a lot of questions. Who is the work for? Who is your Audience? Does your work have to have a narrative? Can one person be the director, writer, puppeteer, designer and puppet maker? Is it an art piece or is it theatre? Can you fill your show with too much? Can you be too precious about your work? Do you need an outside eye? Is the inspiration for the work too vague for your audience? How far away from your Blurb on the programme can you get before it’s a different piece of work? Good questions to remember during the creative process. Day 8: Performing as one; Bad Puppetry. We begin three days with Mervyn Millar of Significant Object. We do walking exercises; thinking of being as one, then using our periphery thinking of how we fit with others and how that affects our movement. We use Breath. We explore movement using sticks, first spending time getting to know the stick (A bit like finding out what the puppet likes to do), then finding movement for the stick and interacting with others. We present quick improvisations using the sticks, discussing the things we like and we find important; Repetition, Rhythm, Vocalisation and Breath, Quality of movement. There is an emphasis on making strong choices, going with your gut. Mervyn encourages us to play, make mistakes. “Do it messy; do it badly. Then you can fix it”. We move on to using paper puppets and working three to a puppet, we explore breathing as one, moving as one. We focus more specifically on the movement, trying to replicate well known figures to the group and it all gets a bit technical. We work on establishing differences and similarities using large paper strip puppets manipulated by individuals; identifying commonality between the strips using movement and breathing, but also allowing them to be individuals. Introducing a three man paper puppet into this; highlighting the strips collective identity. We explored clarity of movement using three man puppets to mime picking up a specific object, getting feedback, could the movement be read specifically by the audience? We then looked at trying to specifically portray emotions, first by establishing the character of the puppet (age, status etc.) agreeing as three puppeteers who the character is helps with the overall sense of the character. We were asked to show how that character would specifically portray emotions. It was very easy to get lost in the game of playing with the puppet, and not specifically finding how that character shows emotion. In my group a lot of vocalisation was used. I personally find vocalising the character difficult; particularly straight off because I think it is very easy for the words to end up not coming from the character and just from the puppeteer. Vocalisation of character can be really helpful, but there is a real fine line between it being from the character and it being from you. Today we were working in groups on different tasks issued to us the previous day. One large group used objects to create a living breathing creature, two groups explored using paper to create animal puppets with multiple manipulators, and a smaller group played with a piece of lycra, playing with the quality of the fabric and all the different possibilities of character and form that could be created with the tension of the cloth. The object group highlighted the complicity required between the puppeteers; each held a different part of the creature (giant insect) all had to move as one but remembering what their role was as part of the structure so as the audience could see the creature rather than a group of people moving objects about. The two Animal puppet groups helped to highlight the importance of trial and erroring when creating puppets, although not a specific design task, it became very clear that using a cheap product like paper to create prototypes of puppets would be a particularly useful tool, when presenting their discoveries both groups had pieces of the puppet that could be removed but in either instance the character could be read, due to the manipulation and movements of the puppeteers. The fabric group (Which I was in) displayed the tensions of the cloth, we discovered a couple of different ways to manipulate the cloth in the shape of a man, one very floppy, one very taught and created a little scene where the character goes from being a floppy young child to discovering the new things it can do with its body. Breath played a very important role in helping to tell the story and the depth of sound helped to show a transformation in the character from big to small, (it was really liberating for me to use my breath and sound like this). 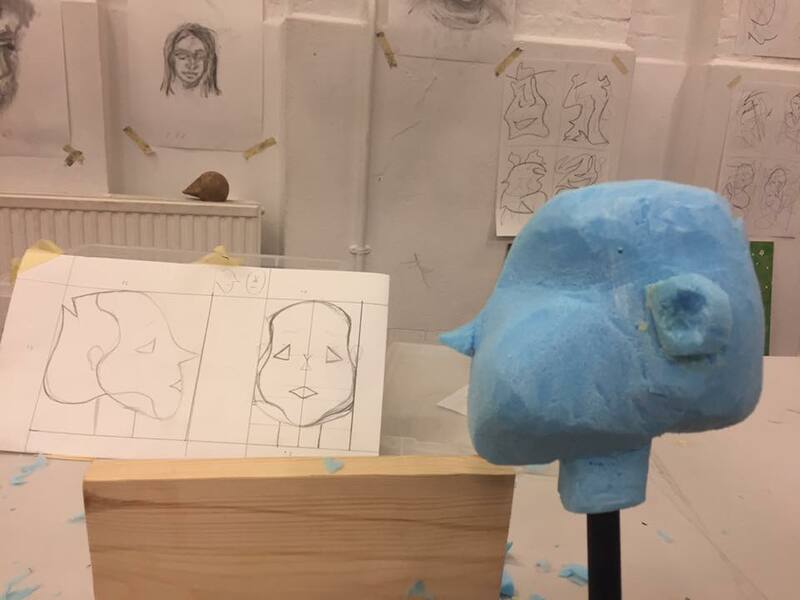 With such a floppy fabric is was important for the head of the puppet to remain as a constant allowing the body to come into focus as the puppet discovered his larger self. Today was a bit of a discovery for me. Today was a day of vocal techniques, some group sharing of discoveries from the week, construction work on our puppets. And more discussion on other performance we had seen (we felt we could answer a lot of the questions that had been raised from the first show we had seen). We were shown some techniques for breathing, to help us breath more fully; Positioned on all fours and letting our bellies flop down (like a cow belly) inhaling and exhaling and allowing our lungs to fill to their most. This exercise is used to help us re-train our breathing so as to help support our voice, and prevent tension build ups in the sternum, throat, shoulders etc. and allow us to relax our bodies and reduce overall tension. We spent the afternoon, sanding and Gessoing (I’ve probably spelt that wrong) our heads, preparing them for sanding and painting the next day. Early evening was another theatre trip, this time to the Little Angel Theatre for Very Old Man with Enormous Wings, at the end of the show we got to see the puppets up close; it was amazing to see all the slight differences and considerations made in the design of each puppet. Our Gesso heads are now dry, we sanded them until they were as smooth as eggshell, then painted them with white emulsion. While it dried we began work on the Bodies, a simple design using a square piece of cloth, marking two holes on the cloth about a foot apart; one to house the neck of the puppet, the other for its gloved hand. Pinning the glove into place and sewing it in, I then hemmed the hole for the neck; the finishes are important to help with the longevity of the puppets (I had to sew the glove in a couple of times to get the finish I wanted). 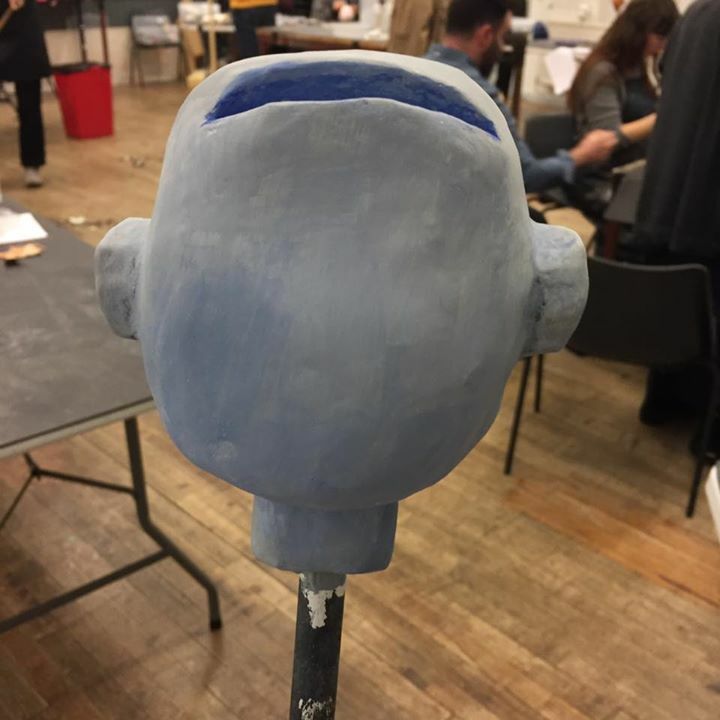 Once the heads were dry we painted them using acrylic and white emulsion, I selected a grey blue for my head, it started off very blue but I felt it was a bit flat so I added some black and white and there were a few moments when it looked like a badger. I built some shoulders for under the fabric to give a sense of body. 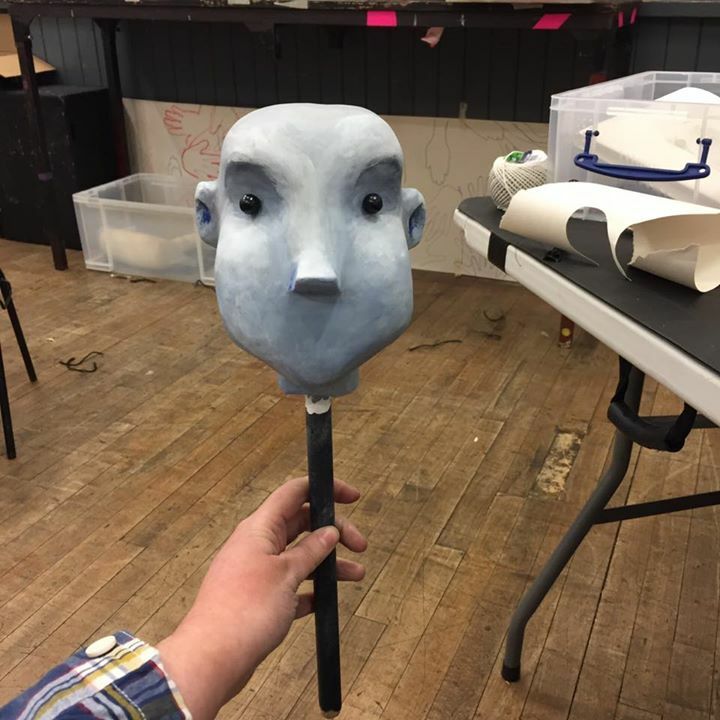 I added eyes, the eyes of the puppet are so important, and the scale of them can really alter the character. I selected some hair for the puppet a beautiful golden yellow, and played about with it a bit, haven’t stuck it on though as I’m not sure whether it really need hair, plus my head has this interesting gash on the back of its head that could be interesting to play with.